The first time Canby and Oregon City met up this season the duo battled to a close result, with the Pioneers walking away with a 43-37 result. 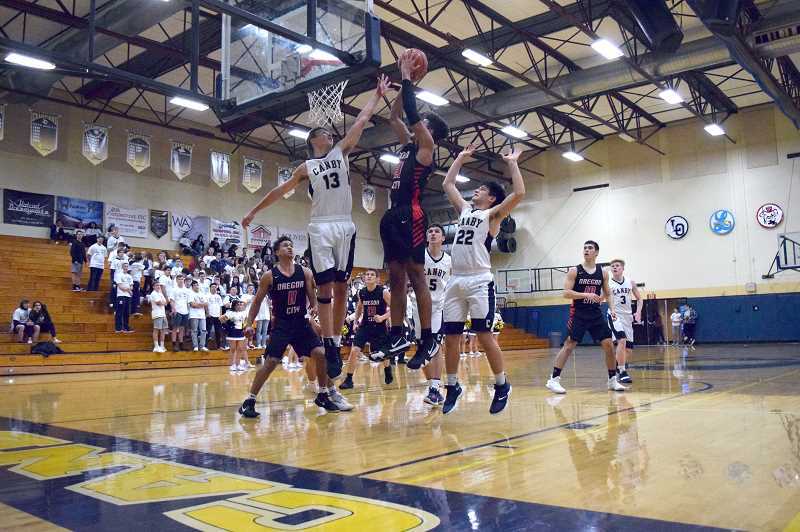 In front of a loud, pro-Canby crowd, the visiting team left no doubt who the better team was on Friday, Feb. 8 as they walked away with a 55-35 win. The no. 8 team in the state relied on its heavy defensive pressure to keep Canby on its heels. The typically dangerous sharpshooters in Canby sophomore Diego Arredondo, senior Rizdin Miller, and Alexander Evans were unable to convert most of their long shots. The trio went just 1-of-9 combined from beyond the arc, and the team at large went just 2-13 from 3-point range for 15 percent accuracy. That was all part of Oregon City's defensive scheme. Frustrating Canby's shooters, the Pioneers were then able to convert on "3's" of their own, going 8-of-19. Junior Andre Best was fed the ball on the perimeter, where he went 3-of-3 from beyond the arc. "Our strategy was to stop their shooters," Oregon City head coach Aaron Newkirk said. "It was pretty simple. We just had urgency on our mind, that was the number one priority, and our kids did a really good job. That's one of the best efforts on defense that we've had in the first 10 minutes of a game. The kids were playing hard and selling out." Another thing dogging Canby throughout the competition was a mental block. The team, normally energized by the Pack the Gym campaign that went on during the school week, started the game slow. Part of it may have been the games start time pushed up two and half hours. 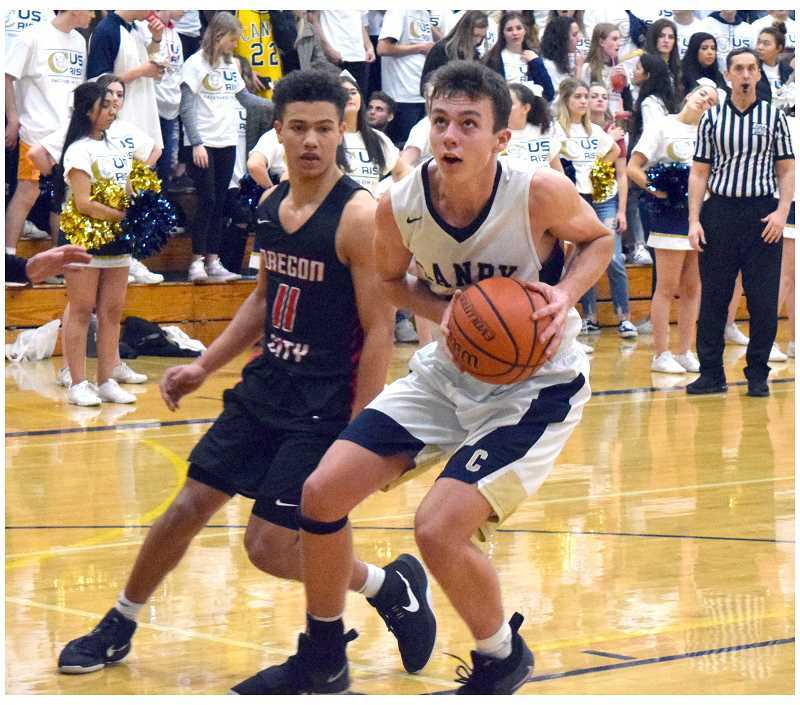 "We've been doing this for nine years, and generally the slow buildup before the girls game helps, and then the guys see the crowd coming in, and they're rested because they get to go home and eat their dinner," Canby head coach Craig Evans said. "We're usually really hyped for that game. Today, the whole sequence of events, it took the power of that away. It's nobody's fault, they had to deal with the same thing. It is what it is." When Canby was able to push past the Oregon City pressure, they were largely successful on the drive. The team 13-of-20 on the inside, and 3-of-4 from the free throw line. Unfortunately for the home team, the lesson was learned too late, as the Cougars found themselves in quite the hole early on. Initially down 11-0 to start the game, Canby found itself down in the first half 23-10. Though it was able to find the basket more frequently in the second 16 minutes, Oregon City outscored the 33rd ranked Cougars in the third and fourth quarters. Best paved the way for Oregon City with 18 points, 5 assists, 3 steals, and 3 rebounds. Senior Erich Nova had 9 points, followed by junior Dalton Welch with 8 points. For the Cougars, sophomore Ben Bailey was the leading scorer with 10 points, followed by the Miller brothers Rizdin and Chance, who had 8 apiece. Sophomore Diego Arredondo had 5 points, and junior Ronan Gay had 4. Arredondo also had the team's two steals. Canby still has its eyes on the postseason. As of right now, the Cougars are ranked 32nd in the state and with three games to go, they believe they can still find a way into the opening round. "We still have to win one or two," Evans said. "Depending on how other teams do, it's out of our control, but let's put us in a situation where it's going to come down to numbers." Canby (7-13) will face West Linn (10-11) on Tuesday, Feb. 12. For Oregon City, the team is now firmly in the no. 2 spot in league, and the focus is on the top team in the state, Lake Oswego (16-4). The two rematch on Monday, Feb. 11. "We have five games left, and we're going to take it one game at a time," Newkirk said. "They're going to be all difficult. Every single game is going to be a war, so we're to single each game out and try to do our best by the end of the year. I think we're doing that. I think we've continuously improved, and I think we're playing our best basketball in the last few weeks."